Light golden yellow with a hint of green, like the color of spring forsythia and clear as a bell, here is one unique white. Lightly floral aromas of orange blossom are followed by fresh, lively citrus fruit, notes of quince and a hint of almond on the palate. Medium bodied with lovely layers, this tastes like sunshine! Pour a glass and invite in the lilting breezes of Spring! Enjoy with fleshy white fish such as halibut, pasta with white clam sauce, a slightly spicy Thai shrimp dish or of course any Mediterranean style cuisine. I love this winery (Terredora Di Paolo), and I have met the winemaker Lucio Mastroberardino himself, on two occasions when he was in Portland, an elegant and generous man. Some varietals from this winery which you may not have heard of (besides Coda di Volpe) are: Fiano di Avellino, Falanghina and Greco di Tufo for white varietals, and Aglianico and Lacryma Christi del Vesuvio for reds. All are available in Greater Portland, and as they are favorites of mine, will no doubt be featured in future articles! 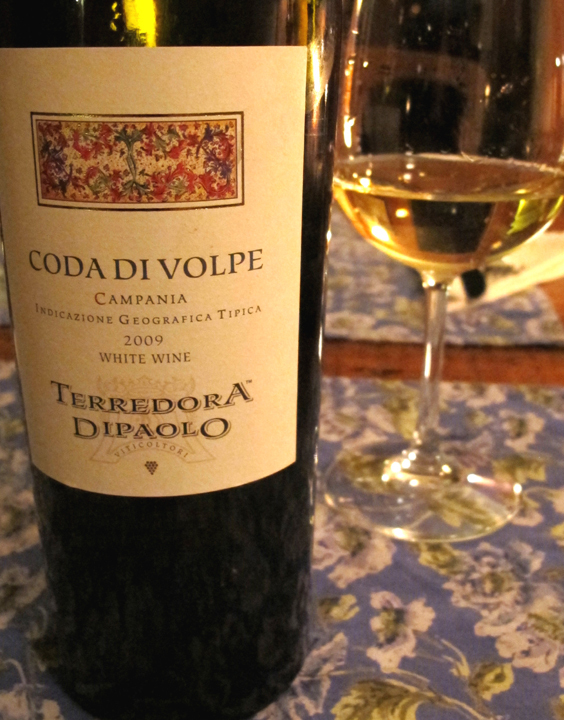 These wines are brought to us by VIAS Imports through Pine State Beverage Co.
Coda di Volpe may be found at Rosemont Markets for the incredible price of $12.99 (originally $16.99!) Only 3 more cases in the warehouse here in Greater Portland). Call Joe Appel @ 774-8129 or email: joe@rosemontmarket.com, for availability at the other stores.